What a day to become a man. April 22, 1889, was only the biggest day in the entire state. It was the day that two million acres of “unassigned lands” were given away to the first person to pound a stake into it. Although he has long dreamed of such a moment, Pa is unable to claim a new home for his family due to an injury. “I can do it, Pa,” says nine-year-old Jesse, “I can get us some land.” So it’s up to the boy to race for his family’s future. Reins in hand, Jesse sits beside Pa in the wagon as they line up for the big race. He finds himself competing against Sooners and roughnecks among thousands of others. The race is a challenge for any grown man, and Jesse is nervous to say the least, but Pa’s steady words of advice comfort him and guide them both over the difficult terrain. Finding a surveyor’s stone will mean a new home and a new start. Above all the tension, Jesse keeps his head and Pa’s wagon on track. The uneven prairie is no match for them. They find a plot and claim 160 acres of their own. As he finally pounds his stake, Jesse understands that futures don’t come easy and there will still be challenges ahead. Una Belle Townsend has been an elementary-school teacher for nearly twenty years. She graduated from East Texas Baptist College and earned a master’s degree in elementary education at Stephen F. Austin State University. She has received many local honors for her writing and is the author of Racecar Driver’s Night Before Christmas and Grady’s in the Silo, published by Pelican. 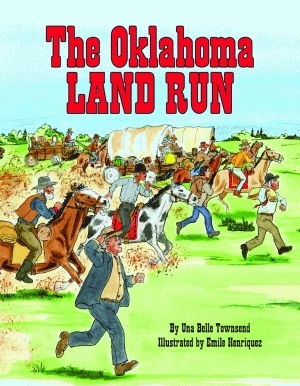 Townsend lives in Yukon, Oklahoma. Emile Henriquez teaches in Louisiana’s parochial school system and has worked as a graphic illustrator since 1963. Henriquez is the illustrator of Pelican’s popular D.J. Series. He lives in New Orleans, Louisiana. Click here for the first 10 pages.